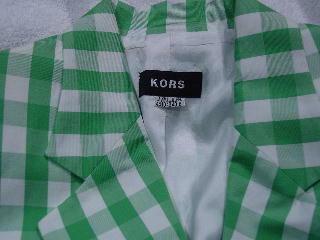 This 100% cotton Kors jacket was made in Italy. It has a white 100% rayon lining and a shirt collar. There is one left breast pocket (which is still partially sewn shut) and two lower front open pockets. 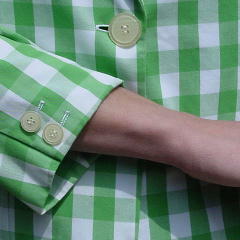 The long sleeves have two iridescent white buttons on each, and there is one larger one in the front. 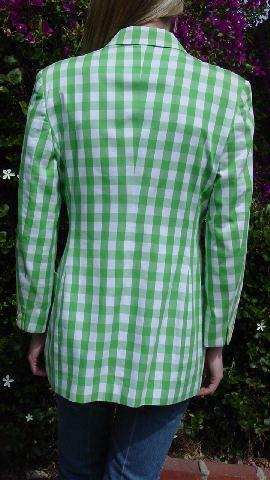 It has shoulder pads and a checkered pattern in Kelly green and white. The tag says Italian size 44, USA size 8, but it fits smaller than that. She wore it with white Versace jeans and tan leather sandals and a Gucci bag traveling on weekends in Italy and Switzerland with her then-boyfriend. shoulder pad to end of sleeve 21 1/2"